In this section you may customize all the available "Advanced Options". "Encryption Password" Password use to encrypt all the debug data included in the compiled file (the password isn't stored in the final compiled file so never hacker can use the debug information to crack your software). You can use the "EurekaLog Viewer" to decrypt the encrypted Exception Logs. NOTE: See the "PasswordRequest" event for further details about the encryption method. 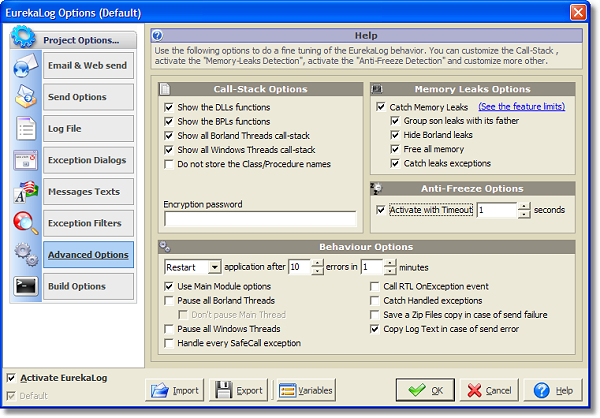 In this panel, you can activate the EurekaLog Memory-Leaks detection and all its related options. NOTE: see the "Memory Leaks Limit" page for further details. In this panel, you can select how EurekaLog detects that your application has frozen. You can choose to activate this feature, set the timeout needed to establish that the application is frozen (to customize the message text to be shown when the application freezes use the "Messages Text Tab"). If EurekaLog detects a frozen application, it raises an "EFrozenApplication" exception with your custom message text.